Allison Walton with UMA Architecture faculty. 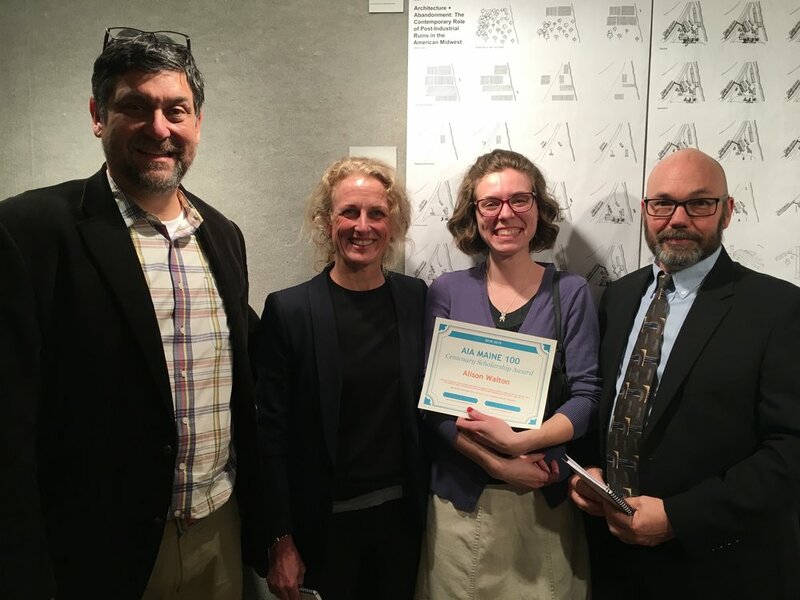 Congratulations are in order to the recipient of the 2019 AIA Maine Centenary Scholarship, Allison Walton. The AIA Maine Centenary Scholarship was created in 2012 in support the University of Maine at Augusta’s Bachelor of Architecture program. This year, the endowed scholarship award totaled $2,800. The scholarship is open to any UMA B.Arch student from Maine, holding a minimum GPA of 3.0. Alison is a second-year Bachelor of Architecture student currently holding a 3.47 GPA who has proven herself both as a designer and a leader. The award was presented at this year’s UMA Student Architecture Show. Each year UMA faculty hold an essay contest to determine who will win this prestigious award. This year’s topic was, “What do you see as the reasons architecture is an important profession to practice?" Each student was limited to approximately 300 words in response. Allison thoughtful response, along with her growth and commitment to the architectural profession, make her a wonderful selection. On behalf of AIA Maine, and the UMA Architecture Program we wish Allison much future success. Thanks to everyone who joined us for our first tour + social of 2019.